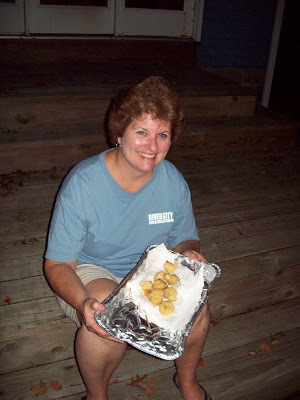 On September 7, I challenged myself to a Julie & Julia-like challenge. In my case: 78 recipes cooking with beer in 116 days. My intention was to start the following day; however, one nagging “you’ll never finish it” thought after another prompted me to pick a couple of recipes from BeerCook.com, hit the store, and COOK WITH BEER. 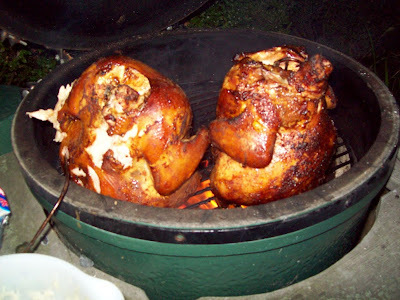 Even though it was already late in the day, I seasoned a couple of good-sized whole chickens, stuffed a can of beer of each birds arse, fired up the Big Green Egg (my ceramic smoker grill), and smoked them using beer soaked hickory chips (recipe 1 of 78). 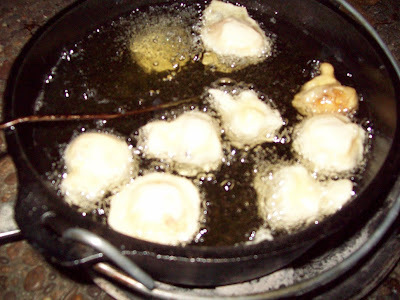 As the birds were being smoked (yes, they are hard to keep lit), I coated some mushrooms and cauliflower in a beer fritter batter and deep fried them in peanut oil (recipe 2 of 78). This is actually a recipe from the classic American cookbook first published in 1896, The Fanny Farmer Cookbook (I bet that Lucy of BeerCook.com won't mind). Sir James: What are you doing? Sir Bowie: Oh, just smoking some chickens and deep frying some vegetables for a starter. Have you eaten? 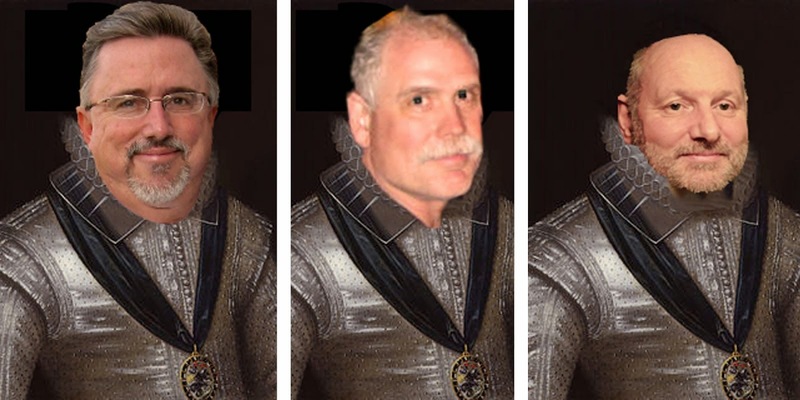 Sir James and his wife Wendy were over faster than a pint of ale past my gums on a warm summer’s eve! It turned out to be perfect timing as the chickens had reached their cooked -- still moist and succulent thanks to the beer -- state of juicy perfection. 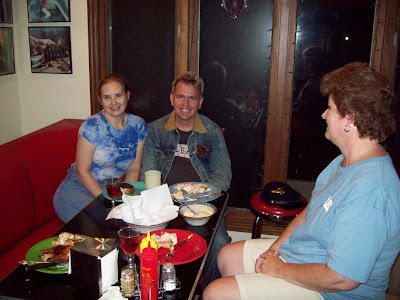 A toast to our newest Knight: Lady Gwendoline of Kensington at the Kuhn Diner! 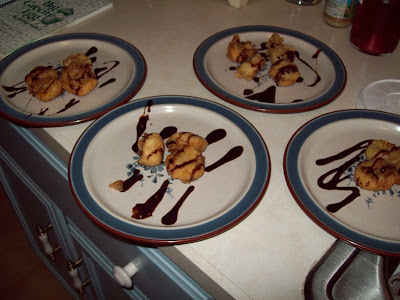 For dessert I presented one more deep fried dish: Beer Batter Bananas sprinkled with cinnamon and sugar and then drizzled with chocolate sauce. All and all, a meal fit for a king – at least a few Knights. So, there you have it, recipes 1 and 2 (I guess I could count the bananas as a third, but I don’t want to claim to be more gluttonous than I already am). 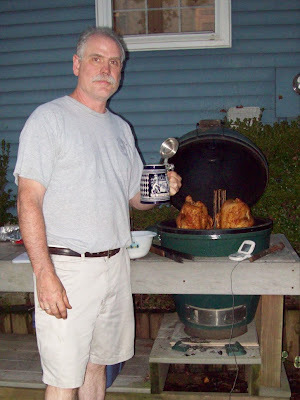 The next two questions: How to cook leftover chicken… with beer? 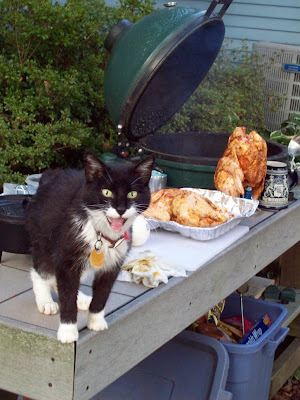 And what strong ale compliments the wild ambrosial of grilled feline? I hope Lucy Saunders of BeerCook.com will be proud of me. Ahh, a royal feast fit for a brother-in-law! It may have just been a slip of the "n," but deep fried dishes are indeed deep friend dishes also. Keep practicing, maybe even go to two-a-days, and good luck! 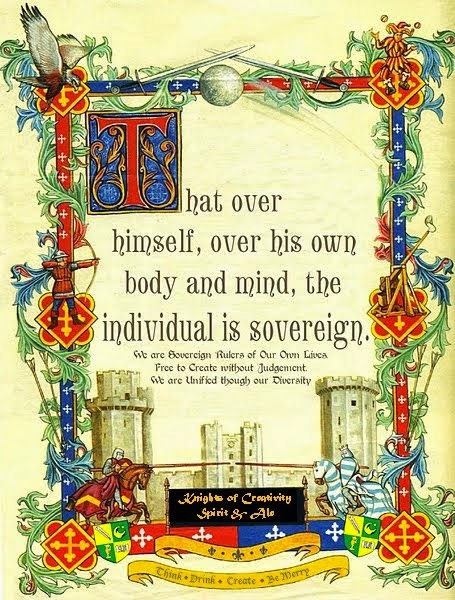 The Knighthood is mighty proud of you Sir B... I am reading this at Lunchtime UK and am now suffering drool meltdown. Is it me...or do those two Chucks look like they are almost enjoying the cook-off ...looking like two folks sat in a jacuzzi?? Fried bananas are your friends. We are enjoying this challenge immensely! home to see what the newest creation will be! A huge WELCOME to Lucybeercook - from one who is enjoying the process greatly! More recipes means more lovely meals at our house! 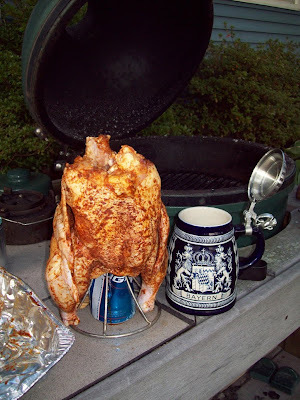 I still can't believe, or maybe I do because it's me, that no one picked up on the Bud Light enema that the Chicken was receiving next to the Green Egg!